OS Property Ajax search module changes your concept about the search modules. Simple design, real-time working and much more performance than you have ever seen on real estate websites. There are many real estate web pages nowadays, but make yours a unique one. Searching for a properties in OS Property system never was so easy with this module. Impress your customers with the clean design and increase your site usability! 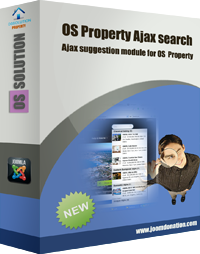 OS Property Ajax search module changes your concept about the search modules. Simple design, real-time working and much more performance than you have ever seen on real estate websites. There are many real estate web pages nowadays, but make yours a unique one. Searching for a properties in OS Property system never was so easy with this module. Impress your customers with the clean design and increase your site usability! Would you be happy, if the visitors could find your contents, articles, and products more easily? This extension uses AJAX technology, which makes searching on your site faster and easier. AJAX can trade data with a web server, without reloading the page. The module use an intelligent search engine: Just start typing any word which you are looking for on the site and you will see the results in a pop-up list. For example: You have a site where you are selling Home Construction properties, using OS Property real estate website. Your visitor wants to find Home Construction properties and information. She/He starts typing Home Construction to the OS Property Ajax search module and can see the results well organized and categorized regarding to the keyword. OS Property Ajax search module can return the results (properties) depend Joomla current activate language at front-end of your site. You can navigate in the search result without the mouse. You can set on the admin interface, how many results you want to show per categories. The search result box can fit to the search input width, and support responsive templates. If you use the keyword gathering the search can suggest the keywords for the user. For more information please check our demo site, where you can test the module live.